Kilbrittain Under-age AGM took place on Monday evening last in the community hall. The following committee was elected for 2015.Chairman Niall Crowley, Secretary Eileen Kenny, Assistant Secretary Judy Sexton, Treasurer Mary Egan and PRO Mary Brennan. Eileen, Judy and Mary Egan were all welcomed on board while the best wishes and thanks of the club were expressed to the outgoing officers, Fergal Keohane, Sharon McSweeney, Lisa Nixon, Michelle O'Mahony and Helen Butler. The positions of Vice Chair and Assistant treasurer were not filled and so will have to be looked at in the next few weeks. The Kilbrittain U12 footballers defeated Argideen Rangers in a 13 aside league final in Kilbrittain last Sunday morning. After extra time it was 1-13 to 3-4. Kilbrittain were up at half time 6 pts to 2 pts.. Kilbrittain points coming from Donagh Galvin (0-4), Mark O'Shea (0-1) and Conor Hogan (0-1). Argideen played with a slight breeze in the second half and added on 3 goals and a point but Kilbrittain replied with points from Donagh Galvin (0-1), Sean Sexton (0-1), Eoin O'Neill (0-1), Colm Sheehan (0-2) and equalizing point from Ronan Crowley. The game went to ten minutes extra time. Argideen added on a point in the first half of extra time but a great point from Ronan Crowley to equalize the game. With everyone thinking we were going to a replay and time nearly up a ball was passed into Seamus O'Sullivan who scored the winning goal. Great work from the Kilbrittain defenders and goalie Mikojaly Kalitka who brought off some great saves and kept Argideen from equalizing. A thrilling game all round. Well done to trainers Pat Hogan, Pat O'Neill, Paul Butler and Brian Kenny. Team includes: Mikojaly Kalitka, Dylan Butler, Colm Sheehan( 0-2), Mark O'Shea (0-1), Cathal O'Sullivan, Conor Ustianowski, Sean Sexton (0-1), Conor Hogan (CPT) (0-1), Donagh Galvin (0-5), Gavin Kenny, Eoin O'Neill (0-1), Donnocha O'Mahony, Seamus O'Sullivan (1-0), Fionn Ustianowski, Ronan Crowley (0-2), Eoin O'Donnell, Killian O'Connor, Ronan O'Beirne, Keith Hunt, Charlie Kenny, Shane O'Connor and Jack Lucey. Meanwhile on Sunday afternoon the u16 team were out again in the County League Final in Kilmurray against St Vincents winning on a score of 3-3 to 0-7,Two goals from Morgan Madden one in each half and a great goal from Aaron Holland with time nearly up sealed victory. The under 15 Hurlers were unlucky to lose in the first round of the county in Kildorrey on Saturday afternoon, defeated by the home team 5-10 to 5-8.Meanwhile the under 12 footballers defeated St Colums at home on Saturday in the semi-final of the league on a score of 1-15 to 1-11.Team Mikojay Kalitka ,Dylan Butler, Mark O' Shea, Colm Sheehan (0-1), Cathal O'Sullivan, Conor Ustianowski, Sean Sexton, Gavin Kenny (0-2), Charlie Kenny, Conor Hogan (0-4), Donagh Galvin(1-6), Seamus O' Sullivan, Donnacha O'Mahony (0-2), Eoin O'Neill, Ronan O'Beirne, Killian O'Connor and Jack Lucey. The Kilbrittain U12 hurlers defeated Barryroe in the plate final on Sunday morning in Timoleague on a score of Kilbrittain 4-5 Barryroe 1-7. The captain of the team Sean Sexton received the plaque from Andrew Whelton. Team: Mark O'Shea, Donagh Galvin, Charlie Kenny, Colm Sheehan, Gavin Kenny (0-1), Cathal O'Sullivan, Sean Sexton (0-1), Conor Ustianowski, Conor Hogan (0-1), Eoin O'Neill (1-2), Dylan Butler (1-0), Seamus O'Sullivan (1-0) and Fionn Ustianowski (1-0). Subs: Killian O'Connor, Keith Hunt, Leon Keaty, Ronan Crowley, Jack Lucey, Ronan O'Beirne and Donnacha O'Mahony. The U12 hurlers had a league game at home against Kilbree winning on a score of 9-14 to 3-3. Panal: Mikolaj Kalitka, Sean Sexton (3-4), Donagh Galvin, Conor Hogan (2-2), Colm Sheehan (0-1) , Cathal O'Sullivan, Gavin Kenny (0-2), Dylan Butler, Donnocha O'Mahony (0-3), Conor Ustianowski, Eoin O'Neill (0-1), Seamus O'Sullivan (4-1), Leon Keating, Charlie Kenny, Killian O'Connor, Mark O'Shea, Eoin O'Donnell, Fionn Ustianowski, Ronan O'Beirne, Keith Hunt, Ronan Crowley, Jack Lucey. The U16 footballers were defeated by Ibane Gaels in the championship in Ballinascarthy on a score of 3-12 to 1-10. Hard luck to the Minor hurlers who were defeated by St James in the West Cork final. A good second half come back was not enough as St James got in for 3 second half goals, two of which the scorer was totally unmarked and the third that went straight to the net from a long range free. Despite that, Kilbrittain kept fighting to the end with three goals themselves, two from Josh O'Donovan and one from David O'Neill and were very unlucky with a coupe of goal bound shots that went narrowly wide. Best of luck to all concerned... C'mon Kilbrittain. Meanwhile the Minor hurlers had a good win over Bantry in the championship last Sunday, winning on a score of 3-15 to 0-6 in Dunmanway. Team Ian Hodge, Dylan Twohig, Sam Dewey, Evan O' Donovan,Josh O' Donovan, David O' Neill, Shane O' Neill(0-1), Gerard Whelton, Patrick O' Mahony(1-11, 0-5f), Darragh Moore(0-1), Ciaran Byrne(2-1), and Philip Wall(0-1), subs Ryan Lombard, Sean O' Brien, Michael Crowley, Calvin O' Mahony, Eoghan Byrne, Bertie Butler, Morgan Madden. Best of luck to the Kilbrittain lads involved with the Carbery Premier 2 minor hurlers. The minor hurlers defeated Carbery Rangers in the championship in Barryroe winning on a score of 3-10 to 3-5. Team: Ian Hodge, Dylan Twohig, Michael Crowley, Gerard Whelton (1-0), David O'Neill (0-1), Evan O'Donovan, Josh O'Donovan (0-3), Patrick O'Mahony (0-4), Shane O'Neill, Bertie Butler, Ciaran Byrne (1-1), Darragh Moore. Subs: Philip Wall (0-1), Eoghan Byrne, Sean O'Brien, Sam Shorten, Calvin O'Mahony, Ryan Lombard, Morgan Madden, Sam Dewey, Matthew Lee. The U16 hurlers were defeated in the championship by Ahane Gaels in Newcestown by 3-13 to 1-10.The U14 hurlers were unlucky to lose to Ibane Gaels by a point in Barryroe on Friday evening. Ibane Gaels 4-4, Kilbrittain 2-9.The U16 footballers defeated Ibane Gaels in a league game in Timoleague on Saturday morning,winning on a score of 6-10 to 4-5. Team: Kynan O'Hara, Ian Hodge, Sam Dewey, Oisin Dewey, Bertie Butler, Tadgh Kearney, Eoghan Byrne, Tomas Sheehan (1-6), Ryan Lombard, Sam Shorten (0-1), Dylan Twohig (2-0), Darragh Moore (1-0), Philip Wall (1-3), Ciaran Byrne, Morgan Madden (1-0). Subs: Nicholas Ustianowski, Aaron Holland, James O'Donovon. The Kilbrittain minor C footballers had a great win against St.Colums on Monday evening in the championship in Newcestown. Both teams found scores hard to come by with Colums to score the first point, and Patrick O'Mahony getting Kilbrittains first score. Kilbrittain added on three points from Ciaran Byrne (free), Patrick O'Mahony and Bertie Butler to leave the half time score 0-4 to 0-3. Substitute Ryan Lombard came on and got a great goal after half time. St.Colums added on two points. Kilbrittain got further scores from Patrick O'Mahony (0-3) and good work by Josh O'Donovan who added on two points. St.Colums were awarded a penalty and scored a last minute goal but Kilbrittain held on for a famous victory. On the night there was brilliant defending by the Kilbrittain backs David O'Niell and Dylan Twohig, but especially Josh O'Donovon, Bertie Butler and Gerard Whelton who played an outstanding game. The team worked together as a whole to secure the win. Team: Darragh Moore, David O'Neill, Dylan Twohig, Ian Hodge, Josh O'Donovan, Gerard Whelton, Bertie Butler, Evan O'Donovan, Shane O'Neill, Patrick O'Mahony, Ciaran Byrne, Calvin O'Mahony (CPT). Subs: Ryan Lombard, Sean O'Brien. The Underage Club had hurling and football games the past week, despite players on holidays the following games had to go ahead. Well done to Patrick O'Mahony and Josh O'Donovan who played with the Carbery Minors on Wedesday last, who defeated St Colman's (a combination of Cloyne and Russell Rovers), on a score of 3-16 to 1-19 and are now in the quarter final against Charleville. Kilbrittain U14 Footballers were defeated by a strong Tadgh Mc Carthaigh team in the championship last Friday evening in Enniskeane. Tadgh Mc Carthaigh led at the half time 3-3 to no score, while Aaron Holland, Padraig Galvin, Darragh Considine, Mark Hickey and Misko Savic, tried hard for Kilbrittain they failed to score in the second half and the Caheragh side ran out winners 6-10 to no score. Team Eoin Galvin, Aaron Holland, Calum O' Donnell, Darragh Considine, Jack O' Donovan, Padraig Galvin, Misko Savic, Donagh Galvin, Aaron Fehilly, Gavin Hodge, Jason Harrington, and Mark Hickey, Subs Kieran Murphy, Cathal O' Sullivan, Eoin O' Donnell, Conor Hogan, CJ O' Connell, and Seamus O' Sullivan. Meanwhile the u14 Hurlers played St Patricks in a League game in Harbour View and were defeated on a score of 5-10 to 1-7. The minor hurlers had a good win over Fastnet Gaels on Sunday evening winning 4-15 to 3-13 . The U14 Footballers are down to play Tadhg Mc Cathraigh in the Championship Friday July 4th in Enniskeane at 7.30 Best of luck to all concerned. Congratulations and well done to Mark Hickey who lined out with the Cork Primary Schools team on Sunday last in Thurles on Munster hurling semi-final day. Kilbrittain Minors Hurlers Played two Games in The non Exam League The Past week.First game on Monday against Pedlars at home winning on a score of 1-8 to 0-10 points. On Friday evening they defeated Erins Own at home winning on a score of 5-17 to 4-8. Great saves by goalie Ian Hodge and defending by backs Dylan Twohig, Sam Dewey, Evan O'Donovan, Eoghan Byrne, Josh O'Donovan (0-3),David O'Neill (0-1) and Midfielders Patrick O'Mahony (0-5) and Darragh Moore (1-1) who supplied great ball to the forwards Ciaran Byrne (3-3), Matthew Lee (1-0), Sean O'Brien (0-1), Philip Wall (0-2) and Shane O'Neill (0-1). A great performance all round. The Under 14 Footballers also played two games the past week defeating Kilmacbea at home on a score of 7-11 to 3-2, and played Sam Maguires in Harbour View winning on a score of 5-12 to 3-7. Team: Eoin Galvin, Calum O'Donnell, Padraig Galvin (1-1), Darragh Considine, Jack O'Donovan, Aaron Holland, Gavin Hodge (1-3), Aaron Fehilly (0-1), Donagh Galvin (0-2), Conor Hogan (0-2), Misko Savic (0-2), Jason Harrington (3-1) and Seamus O'Sullivan. The under 12 footballers played Clonakilty in a league game at home and were defeated on a score of 3-7 to 1-5.The U14 footballers played Clonakilty B at home in Harbour View on Thursday evening and won 5-11 to 2-8.Meanwhile the minor non exam hurlers played Inniscarra away and were defeated on a score of 3-16 to 1-6. Panel Ian Hodge, Dylan Twohig, Sam Dewey, Josh O' Donovan, Evan O' Donovan, Eoghan Byrne, David O' Neill, Patrick O' Mahony (0-2), Shane O' Neill, Daragh Moore, Matthew Lee (0-1), Ciaran Byrne (1-2), Philip Wall (0-1). Photo of Sciath na Scoil team, who were beaten in the Allianz sciath na Scoil final by Barryroe by 7 points, in Pairc Ui Chaoimh. Kilbrittain u13 hurlers played Carbery Rangers in a league game in Kilbrittain on Monday evening and won on a Score of 1-10 to 1-1. The scores coming from Mark Hickey, (0-6), Jason Harrington,(1-0) Spencer Keaty,(0-2) CJ o Connell,(0-1) and Conor Hogan,(0-1).The u14 footballers travelled to Caheragh on Thursday evening and were defeated on a score of 5-13 to 3-4 The minor hurlers had a Non Exam hurling game away on Sunday morning and were defeated by Carrig na a Bhfear on a score of 7-8 to 1-10. The U12 hurlers had a hurling league game at home on Monday evening against Gabriel Rangers winning on a score of 8-3 to 3-6. The scores coming from Seamus O'Sullivan (2-0), Donagh Galvin (0-3), Eoin O'Neill (3-0), Conor Hogan (1-0) and Charlie Kenny (1-0) and an own goal. The U14 Footballers traveled to Kealkil on Thursday evening and played St Colums. They were defeated on a score of 8-3 to 3-6. The Minor hurlers played Balincollig away on Saturday evening in the non-exam league game. They lost on a score of 4-20 to 0-11. Scores coming from Philip Wall (0-4), Patrick O'Mahony (0-2), Josh O'Donovan (0-2), Mathew Lee (0-1), Ciaran Byrne (0-1) and Shane O'Neill (0-1). Kilbrittain U14 hurlers played Pedlars in the league on Thursday evening in Ballinscarthy and were defeated on a score of 2-14 to 1-5. The non exam minor hurling team had their first game in Kilbrittain on Saturday evening against a strong Grenagh team and lost on a score of 4-12 to 5-5.Team Ian Hodge, Dylan Twohig, Sam Dewey, Michael Crowley, Evan O' Donovan(0-1), Josh O' Donovan (0-1), Patrick O' Mahony (1-2), David O' Neill, Shane O' Neill, Darragh Moore (1-0), Ciaran Byrne (1-0), Calvin O' Mahony (2-1), Philip Wall, Sean O' Brien, Eoghan Byrne. In the minor hurling league, Kilbrittain came from well behind to earn a draw with Carbery Rangers on a 3-12 each scoreline. 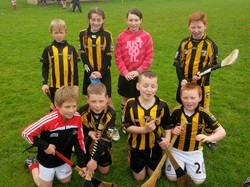 Kilbrittain team who competed in the U10 blitz in Rossmore,Sat 3rd of May. The U13 hurlers had a league game at home on Monday evening against Timoleague winning on a score of 4-6 to 4-2. Team : Mikolaj Kalitka, Gavin Kenny, Calum O'Donnell, Colm Sheehan, Darragh Considine, Gavin Hodge, Spencer Keaty, Donnagh Galvin 1-0 ,Conor Hogen (1-1), Jason Harrington (2-4), Cathal O'Sullivan, Dylan Butler, Mark Hickey 0-1, Seamus O'Sullivan, Mark O'Shea, Eoin O'Neill, Eoin O'Donnell, Donnocha O'Mahony, Killian O'Connor, Shane O'Connorm, Jack Lucey and Leon Keaty. The U16 hurlers played Clonakilty in the league in Clonakilty on Tuesday evening and lost on a score of 2-17 to 3-8. On Sunday afternoon last, the U21 C footballers met St James in the West Cork final in Ballinascarthy. Kilbrittain minor hurlers played St James in a league game on Thursday evening last in Kilbrittain and won on a score of 3-19 to 3-13. Panel: Ian Hodge, Dylan Twohig, Michael Crowley, Josh O' Donovan 0-2, Evan O' Donovan, David O' Neill, Patrick O' Mahony 0-10, Ciaran Byrne 1-5, Calvin O' Mahony 1-1, Shane O' Neill, Sean O' Brien, Philip Wall 1-0, Killian Galvin, Darragh Moore 0-1. The U14 hurlers had two games during the past week and were defeated in both. They lost to Dohneys 8-14 to 2-4, and to Newcestown 6-5 to 1-4. Kilbrittain U12 hurlers played Ahane Gaels in a league game on Monday evening in Ballineen and came home with a win Kilbrittain 6-10 Ahane Gaels 4-2.Meanwhile on Sunday morning at home, the U16 hurlers played Ahane Gaels in a league game and were defeated 0-14 to 2-6. Panel Ian Hodge, Dylan Twohig, Sam Dewey, Darren Burke, Eoghan Byrne, Tadg Kearney, Shane Sweetnam, Tomas Sheehan, Darragh Moore, Sam Shorten 0-1, Ryan Lombard 0-1, Bertie Butler 0-1, Morgan Morgan, Ciaran Byrne 0-3, Philip Wall 2-0, Oisin Dewey, Kynan O' Hara and James O' Donovan. Kilbrittain hosted three games in the U14 hurling Feile on Saturday morning (12th). coming from Aaron Holland 0-2 and Jason Harrington, 0-1. In the final game of the day Kilbrittain and Ballinhassig played out a thriller with Kilbrittain winning on a score of 4-6 to 3-4. the scores coming from Aaron Holland 1-2, Jason Harrington 1-1, Mark Hickey 0-3, Misko Savic 1-0, Mikoloy Kalitka 1-0. Panel: Eoin Galvin, Calum O' Donnell, Padraig Galvin, Cathal O'Sullivan, Jack O' Donovan, Gavin Hodge, Darragh Considine, Mark Hickey, Misco Savic, Aaron Fehily, Aaron Holland, Spencer Keaty, Conor Hogan, Jason Harrington, CJ O' Connell, Seamus O' Sullivan, Eoin O'Donnell, Mikoloy Kalitka, Donagh Galvin. Sean Sexton and Kieran Murphy were Injured for the games. The U 16 hurlers recorded a 5-24 to 2-1 win over St Patricks in a league game on Monday evening and also the same evening, the U 14 hurlers claimed the points by a goal in a 3-5 to 2-5 win over Kilbree in their league. The Minors Footballers played a strong Ballingeary team on Saturday evening (29th) in Kilbrittain. They were beaten on a score of 7-16 to 0-4. The u12 footballers played neighbours Argideen Rangers on Sunday morning in Kilbrittain. It ended in a draw 3-8 each. Jack Lucey and Ronan O' Beirne. Recently presentations were made to the mentors of the all conquering U15 hurling team of 2013. John Burke and Ger Hodge received presentations from Secretary Sharon McSweeney. The U15 team were also presented with commemorative jackets. The Underage club were also presented with the new Jerseys (from Opel Kits for Clubs) for U16/Minor team.